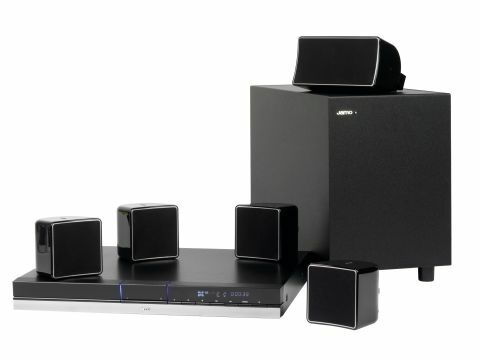 The A 102 HCS11 is a home cinema system combining Jamo's DMR61 DVD player/receiver along with the its A10 series speaker package. All the components are remarkably compact (with the exception of the chunky sub) and its simplistic styling will appeal to minimalist fans. The DMR61 builds on its predecessor by adding HDMI connectivity, but little else has changed. The main unit doesn't give much away, and there are no logos on the front to suggest the powerful home cinema system that lurks beneath the sleek, black and silver exterior. Hidden behind a flap on the front panel there's a USB (V1.1) socket for compatible memory card peripherals and a 4-in-1 fl ash card reader for simple replay of MP3, WMA, MPEG4 or JPEG files downloaded onto the card. There's also an audio input jack on the side of the unit for hook-up to other music players, like an iPod. HDMI connectivity gets top billing, but there are no video upscaling options on the DMR61. Other connections are good, with progressive scan component video output as well as an RGB Scart and S-video socketry. The cube-like satellites are solidly built models housed in magnetically shielded boxes, and can be wall or tabletop mounted. Optional floorstanders are available, costing £70 per pair. The centre speaker is a slightly larger model but sonically matched to the satellites. The partnering subwoofer is the least attractive component in the system, but it's solidly built and houses a robust 200mm bass driver with a potent 200W of amplification. DVD pictures from the HDMI output are bit of a disappointment. Details are soft and edges jittery, particularly around the black letterbox format with 16:9 movies. There's simply not enough detail to draw you in, and images look fl at and uninspiring. Component video images have similar characteristics, but there are also traces of distracting patterning interference in background information. The RGB Scart output is actually the one that delivers the most pleasing results, with the sharpest, cleanest details on display. The surround sound performance is a lot more pleasing, and the 60W per channel amplifier and powerful sub deliver plenty of punch with the Casino Royale DVD soundtrack. The satellites convey a wide soundstage and effective placement of effects, while the sub handles bass effects with plenty of gusto. Music is handled with similar aplomb and fills the room with a punchy performance, but it's not exactly hi-fi quality and errs toward a boomy sound. On paper, the Jamo A 102 HCS11 ticks all the right home cinema boxes with its multimedia capabilities and HDMI socketry. But the DMR 61's pictures are a considerable let down, and we've seen better picture performance from its predecessors.